Many moons ago I discovered Dance Central, which is an Xbox game where one copies an on-screen dancer’s moves thus does workout thus fitness and yay. I had a few criticisms of it, which I told you about here. Still, I was fond of playing it on occasions, even after my neighbour’s 10 year old son blew me away by being able to perform some of the most difficult dances with ease. And then came Dance Central 2, which I got hold of a copy of after a fun escapade at the supermarket. I started playing it yesterday and found that just about everything that annoyed me about the original game had gone away, some better stuff had been added and there I was with a disco in my living room. From looking at the song list I don’t recognise most of them but most of them sound familiar. I think they’re more recent, whereas Dance Central has songs that are definitely oldies. If Dance Central was like being at the school disco, Dance Central 2 is like being at a night club, with a laser light show. It takes photos of you dancing (just as Dance Central did) but when it plays them back it has transformed your living room into a light-filled dancing booth (think neon strip joint). Actually one dance I did the background looked like Willy Wonka’s chocolate factory with Christmas lights but it was a really silly song so that matched. Additionally, the small picture of me that shows in the bottom right corner looks a lot more like me than the Cyberman ghost picture that I remember the original game showed – except I’m rendered in techno-pink, I’m a techno-pink dancing piece of putty that needs to work out more. Sorry that last sentence won’t make sense to anyone who doesn’t have an XBox. It’s easier to follow the moves because you’re shown in advance how many times you’ll be doing a particular move – it kinda works. Also, when breaking down the moves, the avatars perform each move as it follows on from the previous move so you can see how to make it flow. Aside from a few words after they’ve finished dancing, so far I’ve not seen any of the avatars talk. This is a massive improvement as they were a bunch of egomaniacs. In the original game, dances start off quite easy and work their way up rather gradually to energetic. With Dance Central 2 it’s like “you know the deal by now so let’s get working out”; even the easiest dance is quite full-on exercise wise. 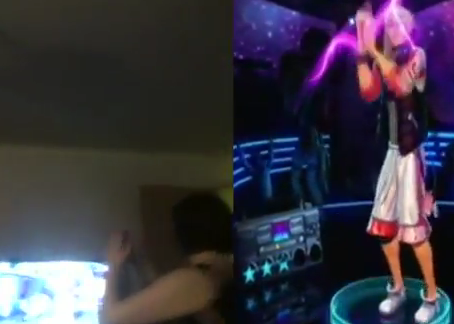 I forget which blog post but I did promise a video of me working out so here it is, me doing Dance Central 2. Ideally one would have DC2 demonstrated by someone beautiful in a shiny leotard but instead you get a middle-aged woman in a flowery dress, sorry ’bout that 🙂 Much thanks to Peter for taking and editing the video.